At least you get to photograph the mural before the demolition. I like the final result of the fence in the foreground. 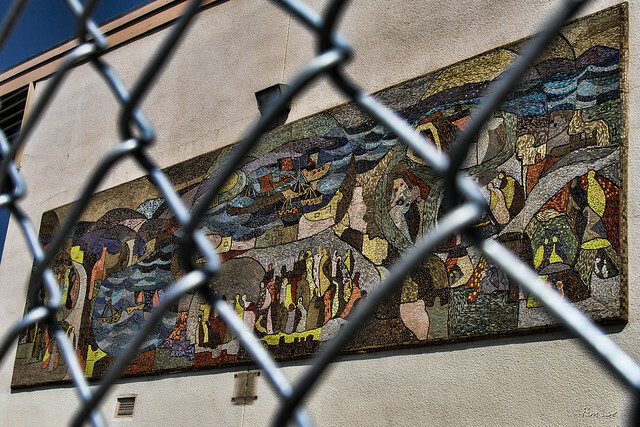 When I found out that they were going to tear down the Downey High School mural I almost cried. Mrs. Troesch was my art teacher back in 1968. My sister (who passed away a few years ago) worked on the mural in 1973 or 1974. She was so proud of working on the mural and I know she too would have been very upset by the demolition of this beautiful work of art.